I guess you can already tell it's another Japanese snacks box from the cover photo... Like I mentioned in my Instagram (if you're following, if not, @ficklerebecca teehee), one does not simply say they had enough Japanese snacks. One can never have enough of them! Well at least not me hehe. This time, I got a Mar/Apr box from Taste Japan! Let's skip all the nitty-gritty details (I know right, it's boooooring) and get right down to the unboxing and review! This month's box features 9 Japanese snacks, with a double of one of them, making it 10! There is a letter (in English) in the box telling me how Japan will be like in the months of March and April. On the same page, there is also a 'Spring Vocabulary' list teaching you Japanese words and their meanings. While on the opposite side, there is an itemized list showing the products I received in the box. You can also check out more information about the snacks on their website HERE with the password you receive on the letter. OK, back to the snacks! Who is/was a Kamen Rider fan? "These slices of real Japanese sweet potato have been dried as they are and just salted a little. A kind of healthy kids based snack including a free sticker!" Sweet potato chips?! I haven't tried one before this and now that I have, I love it! Hansel kept taking this out of the box before I have taken pictures of them and I had to tell him all the time that he can only have it after I'm done with the pictures. He knows that's the perfect treat for him! And I told him he can have it so I let him have most of it and only tried some so I can review it. It has a very unique taste! A good one of course! You cannot really tell from the picture above but they're really thick chips. "We can't get enough of Umaibo! The perfect size singular crisp, this one is chicken curry flavor." Damn right you can't get enough of it! I had the cheese one in the Freedom Japanese Box and it was so good I can't wait to have another one. Now I got a curry flavored one, and it didn't disappoint! Give me a carton of it thanks! "A piece of lemon gummy, covered in a kind of sherbet like sorbet, coated with silky milk chocolate. Sure to be a favourite." It's delicious, is all. Meijilicious. "A mini piece of pudding style Japanese cheesecake in the form of an individually wrapped sqaure. Two included — feel free to share!" It's too small! Why so small? Not enough for me! It's so freaking yummy! The bottom layer has this crunchy thingy in it, adding texture to the cheesecake. I have nothing to complain about this except, MORE THAN 2 NEXT TIME PRETTY PLEASE!!! "And as a perfect accompaniment — a side order of green veggie salad.... Umaibo!" Need I say more? Ok yes, not as good as the cheese and curry ones hahaha! "A small bit! Bubbly "Aero" style strawberry mousse covered with chocolate. Delicious." "Japanese plum flavour gum, a great sweet refresher after the chicken curry umaibo!" "These are real Japanese plums that have been dried and coated in honey. Opinion is usually split between love or hate on these." Oh it's in a resealable bag so you don't have to finish it in one go. "Blood orange gummy candy. Plenty of vitamin C and super juicy." Blood orange, yes. Gummy candy, yes. Plenty of Vit C, not sure. Super juicy, hmmm... is it? Or is it just the taste of the gummy infused into your saliva??? They're heart shaped! And in a resealable bag too! It took about a month to reach me from Japan. They offer 1 box for a 1 time payment of £15 to try their service without commitments. or 1 year at £160.00 including shipping and no hidden charges. Stay updated with news from Taste Japan by liking their Facebook page or follow them on Instagram @tastejapan. 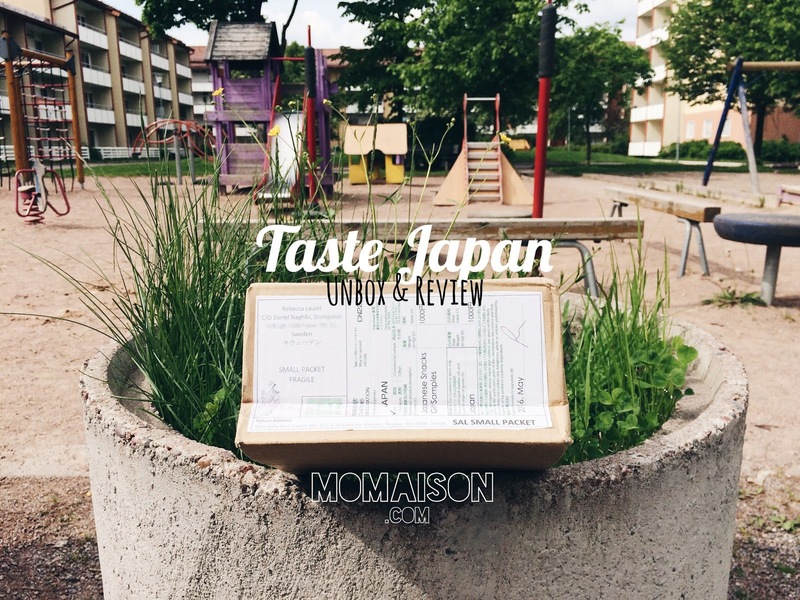 Disclosure: I was provided with Mar/Apr's box from Taste Japan for the purposes of this review.